There’s a wonderful thing happening over at one in ten. Eireann Lorsung‘s mom has suffered a hemorrhage in her brain, and the crafting community being what it is, there is an auction to raise funds to help out with her medical bills. You can bid on pieces by Lisa Congdon, Amanda Soule, Stephanie and Mav of 3191 fame, and many more crafty bloggers. Find out more about the participants at the one in ten site, or just browse the list of eBay auctions. You have until Friday to get a head start on your holiday shopping, in the name of a very good cause. This entry was posted on Sunday, August 19th, 2007 at 5:05 pm	and is filed under jewelry, web. You can follow any responses to this entry through the RSS 2.0 feed. You can leave a response, or trackback from your own site. I have a pair of these earrings in a different material and I wear them all the time. 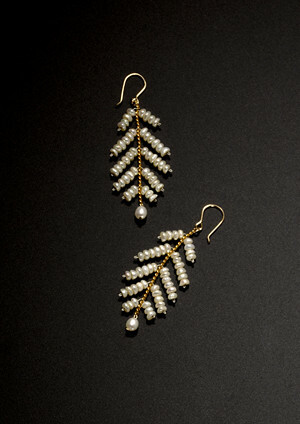 They are my favorite earrings because they are simple, elegant, and classy all at the same time. Estyn is a master of the design and craft of the piece being intrinsic to it’s meaning …. The earring are SO beautiful! Really beatiful! Thanks everybody. Makes me feel really good, and kinda embarassed. thanks again for your kindness. the earrings are lovely.